I am glad to inform you that the English version of my book "Gurevich, Gurovich, Gurvich, Gorvich, Gurvitz, Horowitz and others. The History of a Great Family", published previously in Russian (Haifa, 1999, ISBN 965-222-971-7, copyright: Shlomo Gurevich*) is now available. The book contains the history of this famous Jewish family, as well as the genealogy of many of its sons from medieval Spain through Bohemia, Poland, Germany and Austria to Russia, Israel and USA. It also contains 147 biographies of outstanding representatives of this family who were famous rabbis, scholars, artists, scientists, engineers, musicians, soldiers, writers, revolutionaries, secret service agents, Zionists, Heroes of the Soviet Union, and among them Rabbi Zerachyah Ha-Levi from Gerona, the Holy SheLaH, M. Gurevich (aircraft designer), V. Horowitz, Karl Marx, F. Dan, N. Zarkhi, Rabbi Israel Meir Lau. The book will prove of interest to the bearers of these surnames and other descendants of the Horowitz family as well as to a more general reader interested in Jewish history and Judaism from the Middle Ages to contemporary times. It contains an extensive bibliography, statistics and helpful information for those engaged in genealogy research and search for relatives. The book is about 130 pages in length with appendices. Yehudit Agracheva, Journalist ("Vesti" Israeli Russian newspaper): "Very interesting book"
Moshe Goncharok, Historian (Jerusalem): "Good work"
Chaim Horovitz, Biochemist (Rechovot): "Wonderful work"
B. Gidalevich (Qiryat Shmuel): "Pioneering research"
Menachem Argov, Dr. Menashe Horowitz (The Horowitz Families Association, Tel Aviv): "Thorough research of the Horowitz family history"
Ilya Gurevich (Sacramento, CA): "You've changed my life"
Stephanie Horowitz, Publishing Manager(Binghampton, NY): "Fascinating book"
Judith Wolkovitch, the Horowitz Families Association of Diaspora (Rolling Hills Estates, CA): "Congratulations on a fine effort"
Nachum Tuchman (Tekoa, Israel): "Very informative"
Simon Horowitz(Littleton, CO): "Very useful in my on-going research"
Miriam S. Butler(Epping, Australia): "Your book is unbelievable and filled in so many of the spaces I had"
The book was introduced at the 22th International Conference on Jewish Genealogy in Toronto in 2002. The book is available in pdf format. Its price is $20. After the ordering, the file will be sent by e-mail directly into your inbox. 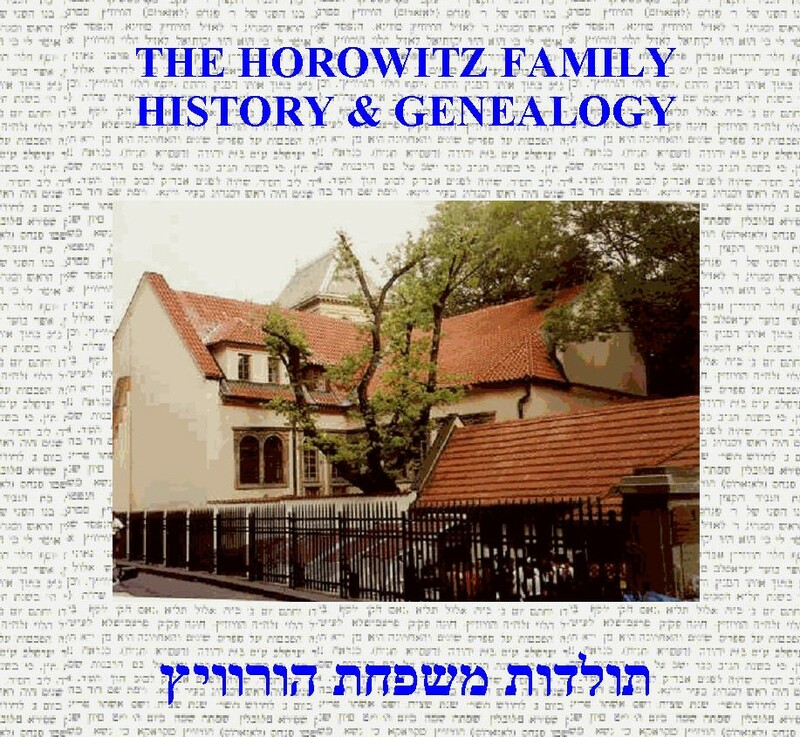 The Rabbinical Horowitz Family database is now available on the CD "The Horowitz Family History And Genealogy". The database wich in fact is a computerized family tree, contains more than 5,500 names names and much biographical information about them. It was created with the DOROTREE genealogical software which to-day is the best available genealogical softaware, specially developed for needs of Jewish genealogy. It contains two dte files which can be opened with DOROTREE: Horowitztree.dte (substantionally updated) and Horowitzbranches.dte. The former includes the main Rabbinical Horowitz family tree originated from a dynasty of Spanish rabbis. The latter includes the database of Horowitz rabbis whose connection to the main tree is not known. The two dte files contain information both in English and Hebrew, about 5,500 names. 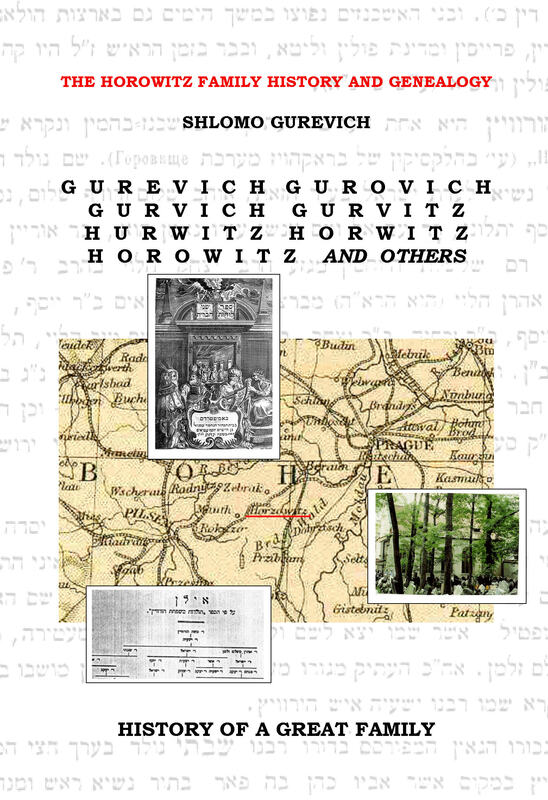 The same information, but only in English is contained in two parallel GEDCOM (ged) files: Horowitztree.ged and Horowitzbranches.ged. These files can be opened with many types of genealogical software.The disk also contains a number of interlinked MS Word files which include the index, introduction, early history of the Horowitz family, biographies of the famous Horowitz rabbis and references. The texts are mainly taken from my book and are illustrated with numerous photographs. Four pdf files containing major Hebrew sources are also included. Gary Mokotoff's article "A Very Unusual Feature of a Genealogical Software System" in Avotainu's "Nu? What's New", Vol.3, #18 presents advantages of using this software.